Stick around for a tutorial and some Zooper-tips. Let’s walk through setting this up, using my Resto Druid as an example. First, I am going to do my raid setup. Edit + Rename: I start with the default Restoration setup that I already have. First, I click the edit icon and rename it to Restoration Raid (choose any name you want). Make sure the specs are in the priority order that you want, with the most important one at the top. Drag & drop to reorder them. The most important thing to do is order your specs from most-to-least important. #1 setup (DPS spec) takes the 370 helm and the best DPS Azerite Powers. #2 setup (Heal spec) gets to choose between the 370 helm + DPS Azerite, or the 355 helm with healing Azerite Powers. (Mr. Robot evaluates this and picks the best option). Let’s say the #2 setup chose the 355 helm, locking in the heal Azerite Powers. 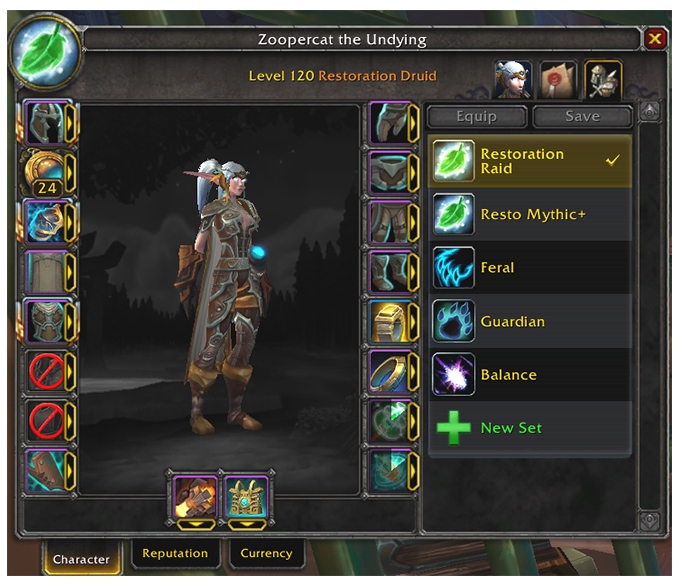 Your #3 setup now has to choose between the 370 + DPS Azerite or the 355 + Heal Azerite helm. This applies to gems, enchants, stats on gear, and basically everything Mr. Robot will look at when optimizing your gear. Choose your Gearing Strategy and Talents for this setup. Choose your gem, enchant, and azerite settings. Don’t forget the Reorigination Array setting at the bottom! These are important because they impact the optimizations. All optimizations are based on simulations custom to your specific character, talents, gear, etc. We’ve already done every simulation necessary to optimize for you (so you don’t have to spend time simming, hooray!). 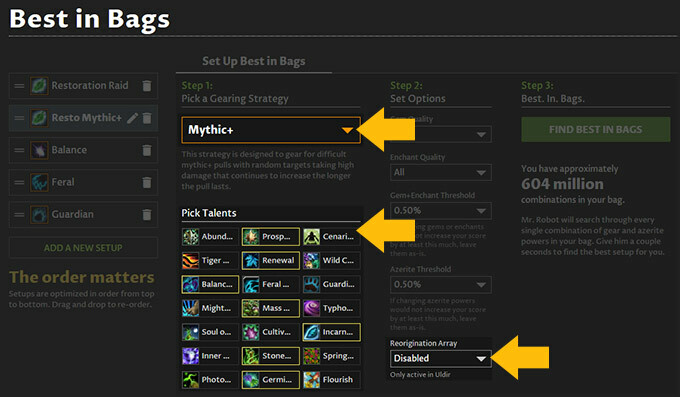 If you change talents, or set the Reorigination Array value to disabled (for Mythic+), all of these things will cause Mr. Robot to lookup a different set of simulation results. That helps him pick the best gear, totally customized for you. Gearing Strategy: I am choosing the Raid Healing strategy, which is based on simulations that mimic the Vectis fight (which is very hard on healers). Take a look at how we sim healers and tanks, if you are curious. Talents: you can change your talents right here, and it will be saved to this particular setup. Note: importing from the addon will update gear, but not talents. With these setups, we always want you to have the control on what talents are being used in optimizations. 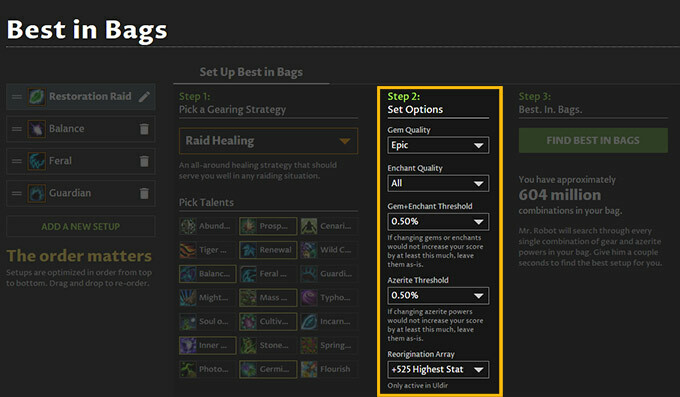 Gem & Enchant settings: choose the quality and thresholds. Thresholds work like this: if the optimizations aren’t higher than the threshold, Mr. Robot leaves the gems/enchants as they are, saving you gold. Reorigination Array: set this to the level that matches what you currently have. 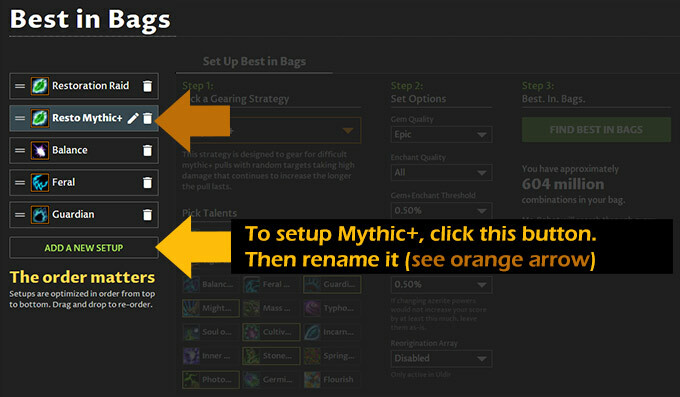 Choose “disabled” for Mythic+ or any other setup outside of raiding. Now we make a new setup for Mythic+ which will (likely) require some talent changes, a gearing strategy change, and disabling the Reorigination Array. Add a new setup and rename it. Click the “Add a New Setup” button below your spec list. Then click the edit icon (pencil) next to the new one to rename it. Drag & drop to make sure your setups are in the right order: most important at the top. Make sure it is in the right priority order. If Mythic+ is the most important spec, make sure you drag & drop it to the top. Remember: the top spec gets first choice of the best gear, gems, enchants, and Azerite Powers. 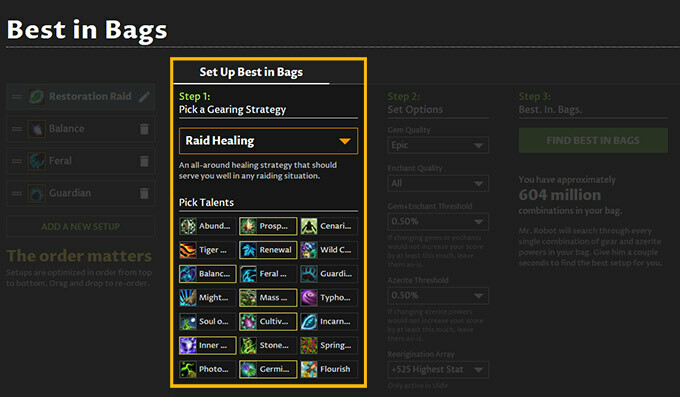 Choose your Gearing Strategy, talents, and disable the Reorigination Array. 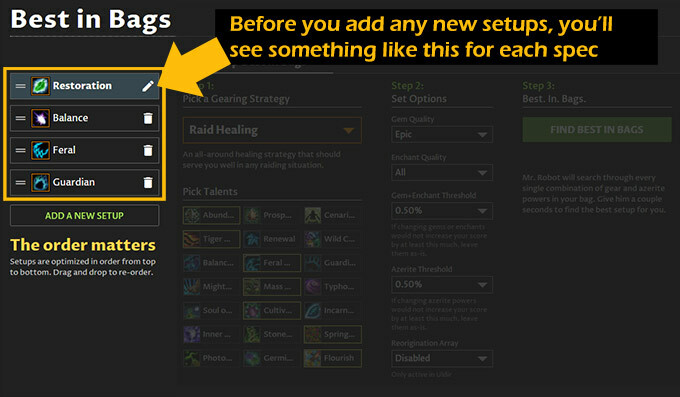 There are definitely a few settings that I want to change for Mythic+ compared to my Raid setup. Gearing Strategy: Mythic+. We simulate a typical Mythic+ run, which has a bunch of group pulls, followed by a single target boss. The gear results for Mythic+ are based on those simulations. Talents: if you use different talents for Mythic+, pick those here. Reorigination Array doesn’t work outside of Uldir, so be sure to set this to disabled. See how many combinations are in your bags (just for fun). And click the green button. Now that you have the setup, click the green “Find Best in Bags” button. For fun, you can see how many combinations are in your bags (below that button). Mr. Robot analyzes every one of these combinations by looking up the simulation data for your character. Right now you get 1 default setup for each spec, and then you can have 3 extra setups (for any spec or combination of specs). Each time you run Best in Bags, Mr. Robot optimizes every single setup in order to juggle your gear. This takes a lot of computing power and adds load to the servers. Adding in even more setups can potentially double the computing power and server load. That’s why we are testing this current limitation of 3 extra setups. With multiple setups, you can now also export all of them to the addon at once. Yay!!! This means you can easily swap between the optimized sets in-game. 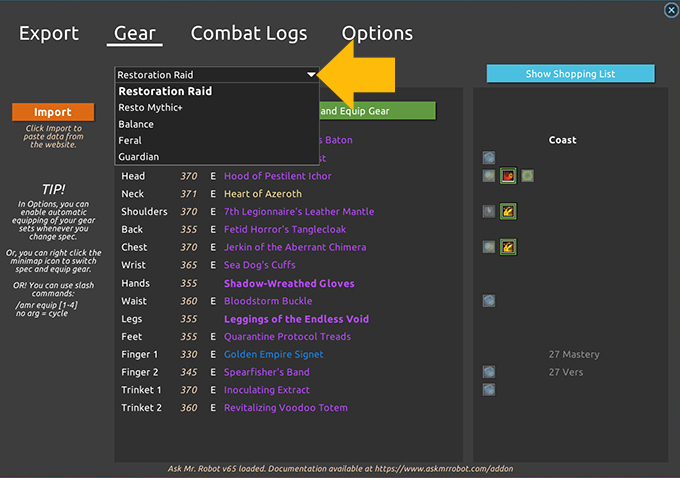 The top of the gear tab in the addon has a drop down menu to swap between your setups. In the picture above, you can see my Resto Raid setup, my Resto Mythic+, Balance, Feral, and Guardian setups. You can click the green button to equip any gear set. The setups are automatically added to the in-game equipment manager the first time you activate and equip that set via the addon. The name used on the website is the name used in the equipment manager.